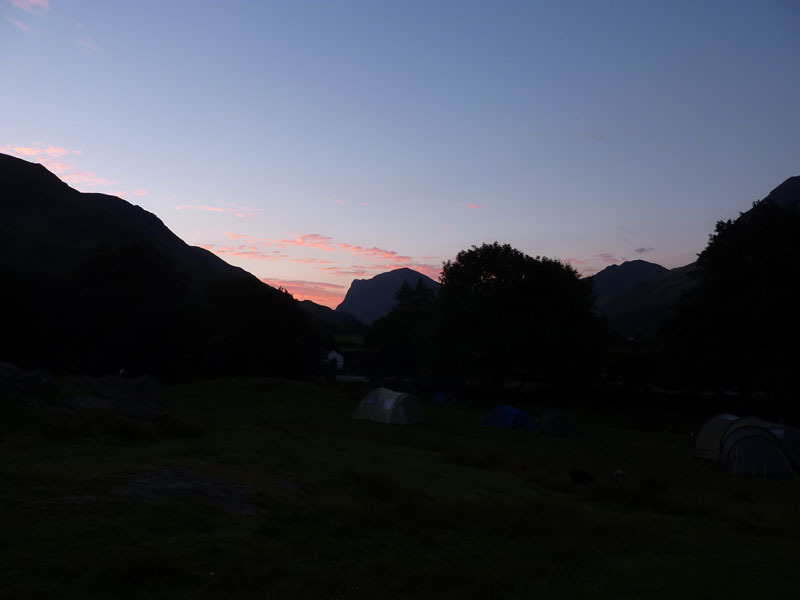 My plan for the weekend was to camp at Buttermere, Neil offered to pick me up on Saturday morning, so that I could do a long and very interesting walk, including all the important bits of Neil's walk and then a few added extras. The weather was looking good, but what is that they say about red sky in the morning? 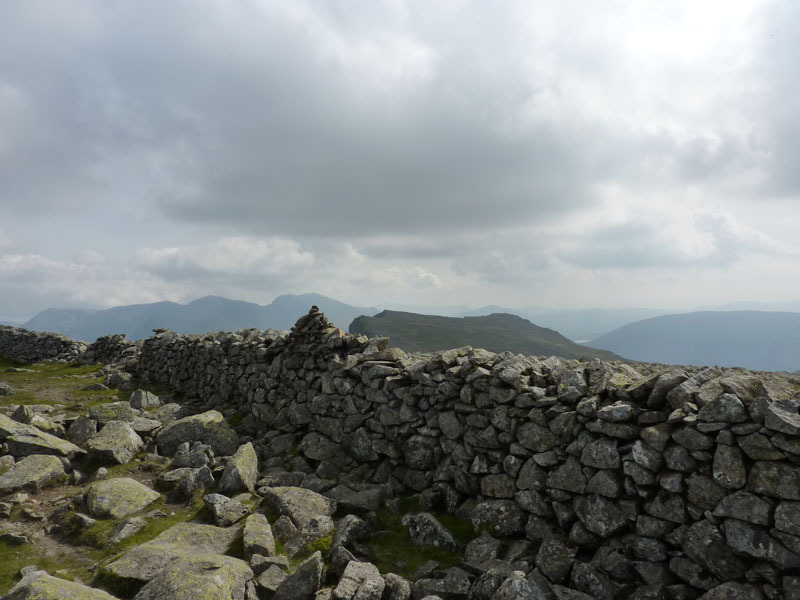 The header photo was taken on one of the walks Neil and I did together earlier this year as he tackled his fells-not-done list. 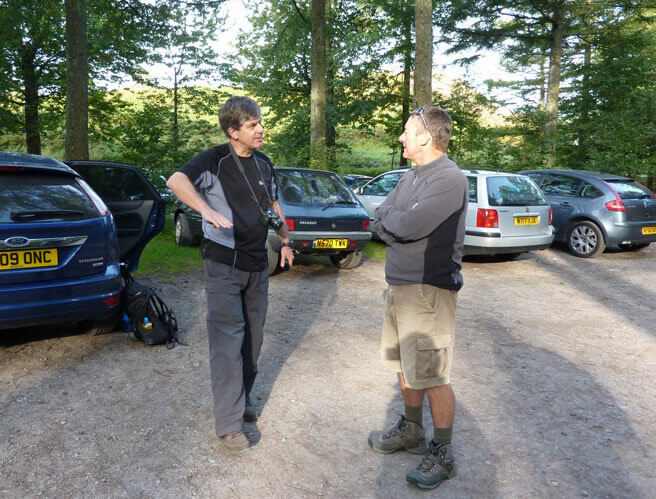 We met up in Bowness Knott car park. Neil explains how to relax against the bar, back in their local in Derbyshire. Everyone stops here to take a photo. 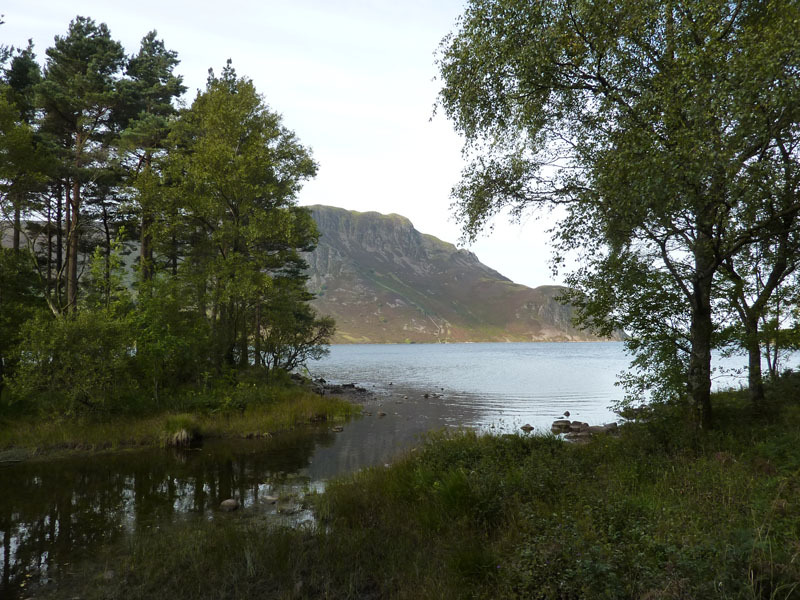 Our route follows the north shore of Ennerdale Water. 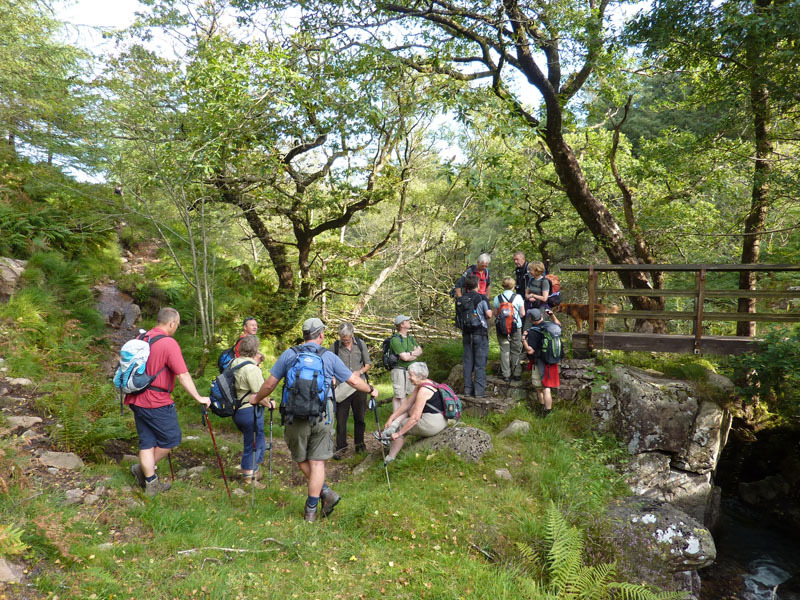 Our group, as many as 16, crosses the bridge and heads for the route up to Caw Fell, Neil's 213th, the author's 190th. 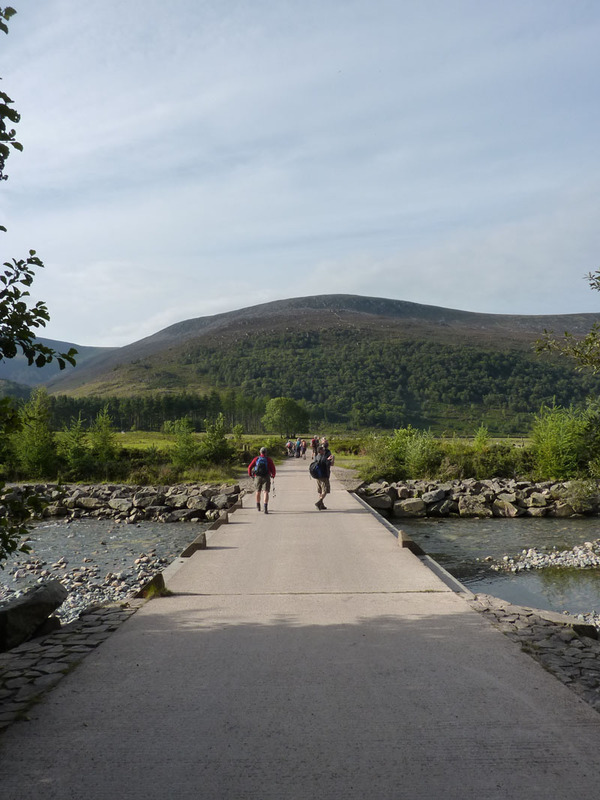 Initially, nobody was prepared to be first across the bridge, there was a stand-off. 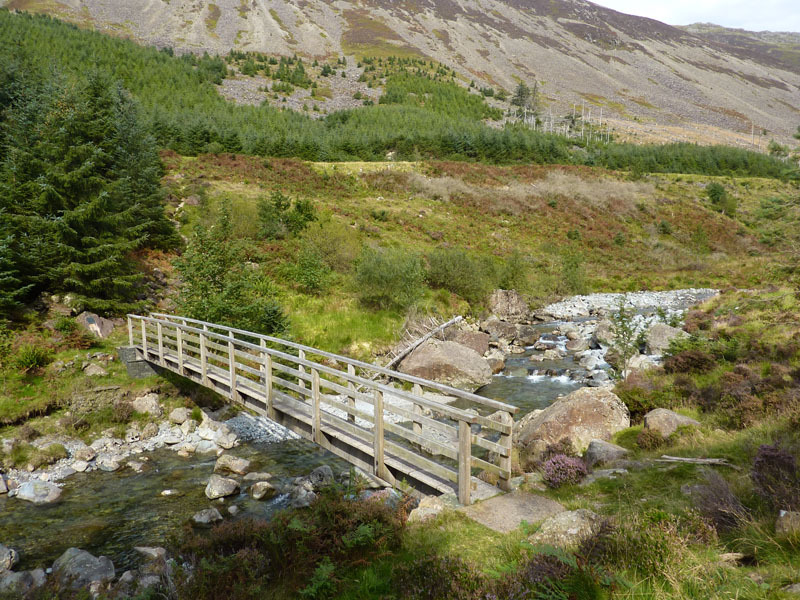 But, we got it sorted and go over the bridge, turn right and head on up the fell. 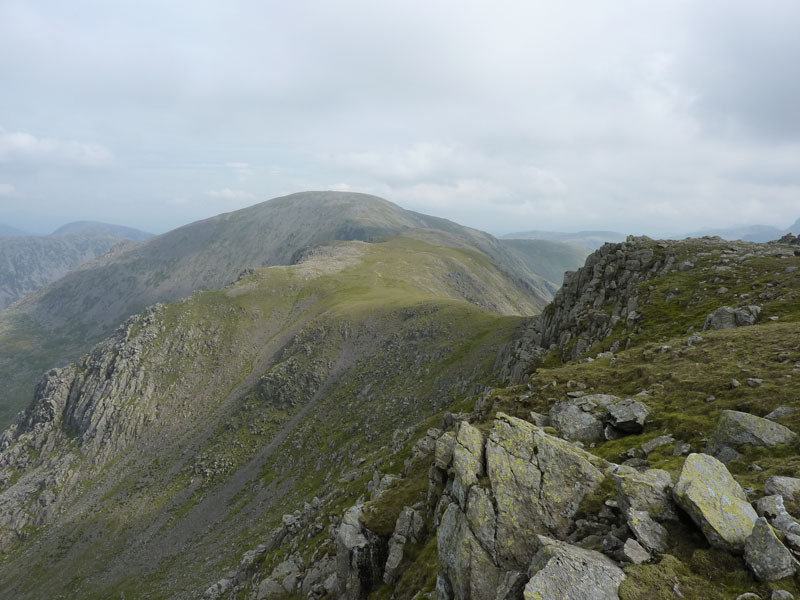 Once we meet the ridge between Caw Fell and Haycock, we will turn right for Caw Fell summit. 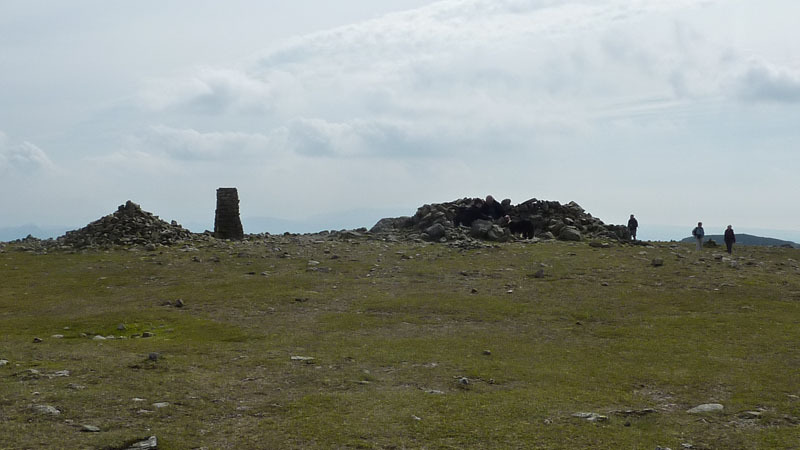 The advantage of getting there at the head of the group is that you can take an uncluttered photo of the summit cairn. 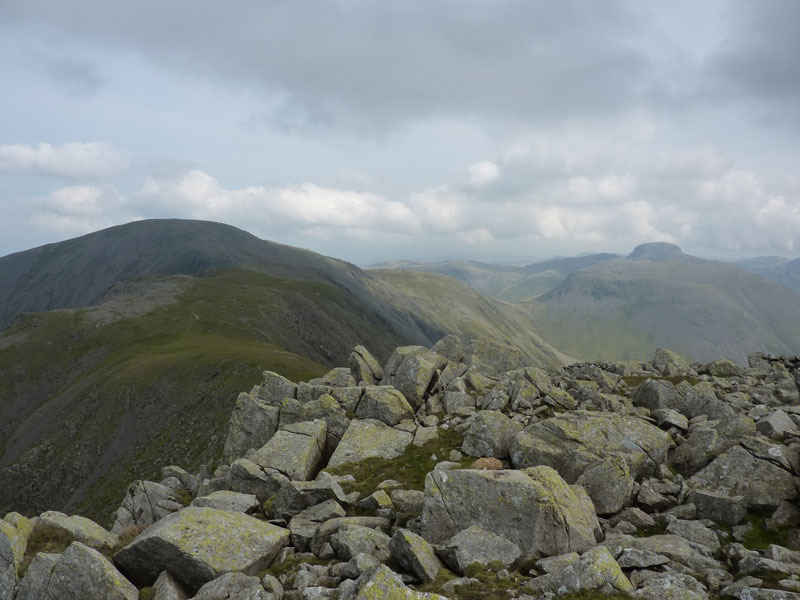 The un-chaptered fell of Iron Crag is in the background. The heartbeat quickens as Neil spots the route to the end of his quest. Those are Andrew's walking poles, in case there was any doubt. Haycock interfered with our route from Caw Fell to Steeple, but nevermind, it's a new summit for me and a few of the others in the group. Haycock is the most westerly of the fells over 2,500ft and, in time, I would like to do a proper ascent of this fell, maybe from Wasdale. 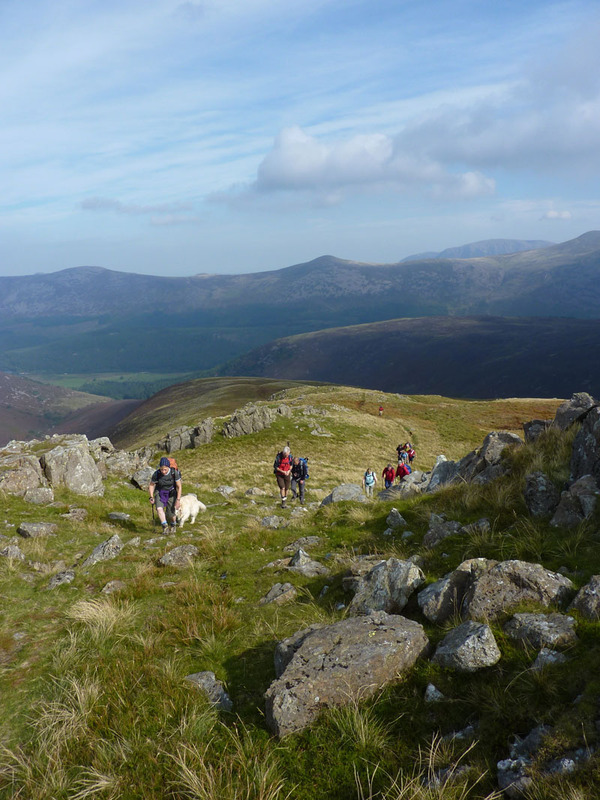 Next up is a descent followed by a 450ft ascent to Scoat Fell. Well, it came into view earlier, but it was rather hazy. This closer view is better. Real mountain scenery from now on! Steeple from Little Scoat Fell? Here it is a little confusing, reach for your OS 1:25,000 OL4. 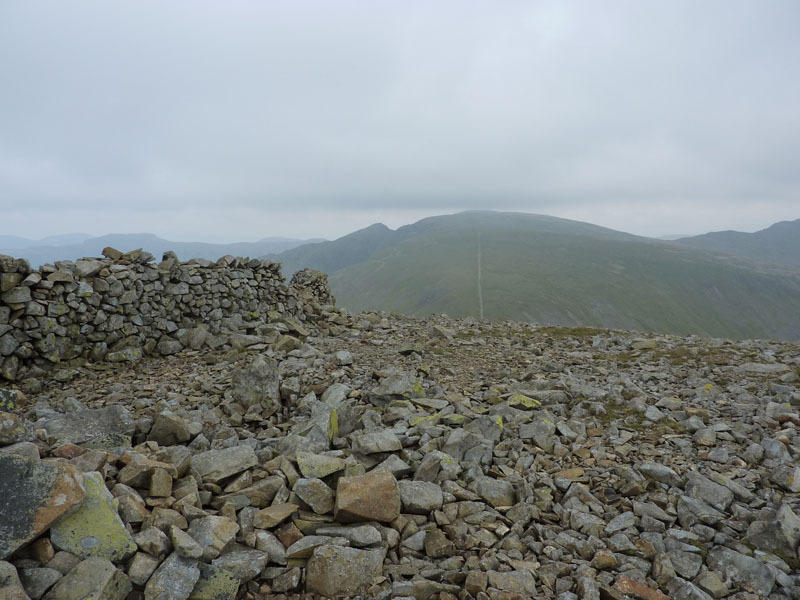 The area all around is Scoat Fell, but the map shows a subsiduary summit to the west as "Great Scoat Fell" and the main summit to the east as "Little Scoat Fell". 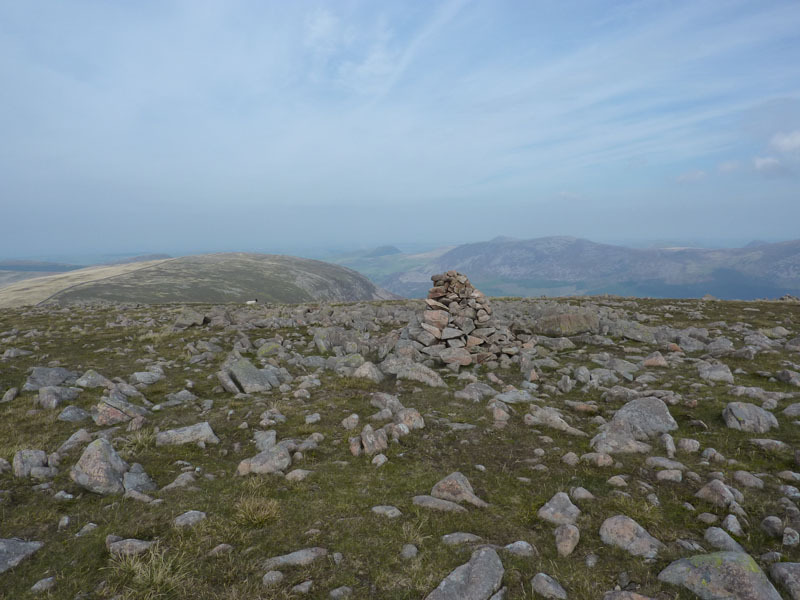 The summit cairn sits on top of the wall, less than satisfactory - an untidy fell top. Surely the top is "Great" and the not-top is "Little". Forget about it now, there are more important matters to attend to. 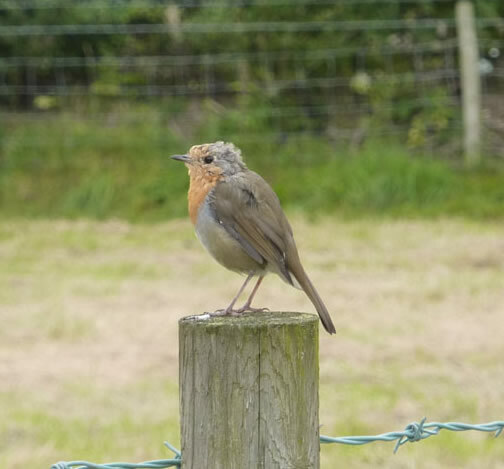 Here, I'm not in the best position to take the photo, others will have taken a better shot. We are on Steeple. Well Done Neil! It's Neil's moment, see how the sun has come out in strength at just the right time. Mark is nearest the camera, David Hall and David Dimmock keep an eye on proceedings. 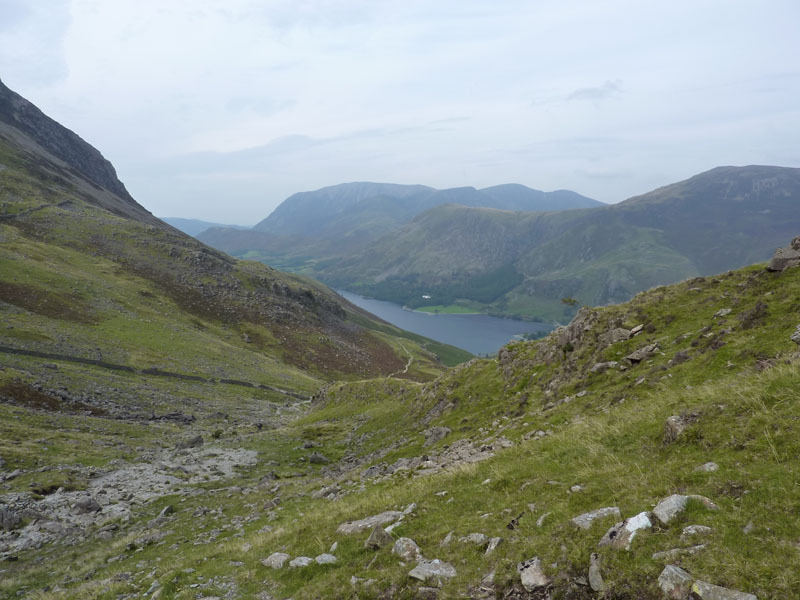 The time has come for me to leave the rest of the group; I can assure viewers that I am not anti-social, but my plan for the walk involves me heading back to Buttermere over Pillar and Scarth Gap. Best foot forward, it's a fair trek from here. I'm looking forward to the next hour, or so. 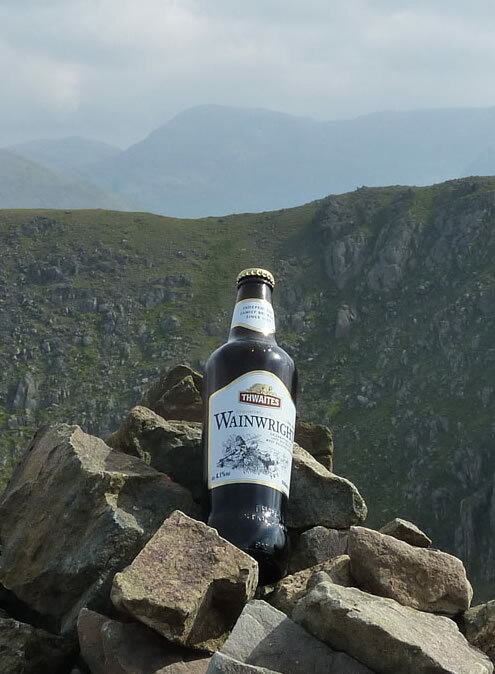 This is fellwalking of the highest order. 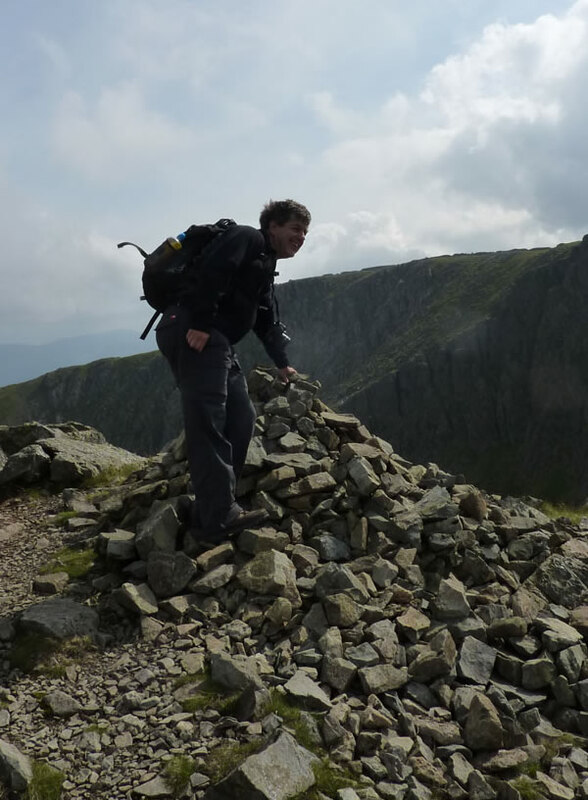 These fells are the most difficult to get to for those not living in West Cumbria. 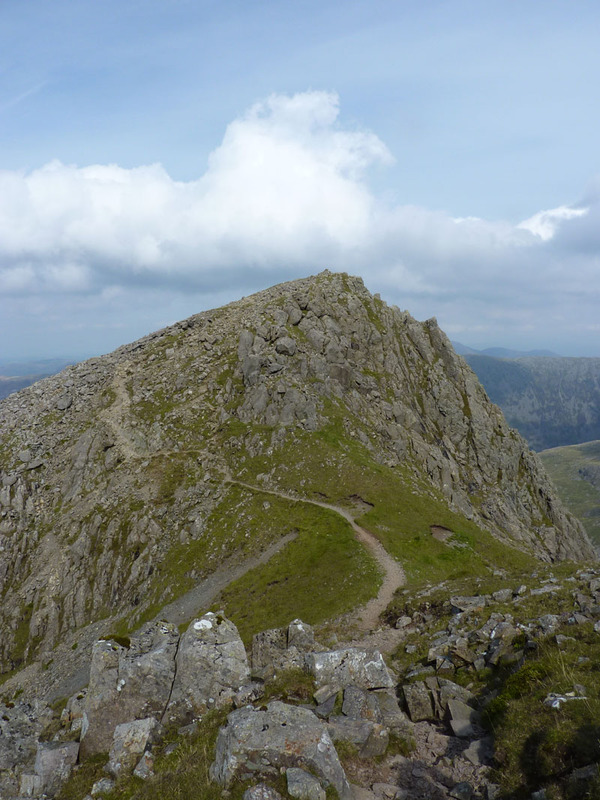 It will be only my third visit to the top of Pillar, but a new approach. On the way to the top, I passed a group of five, looking for their sixth. I hope everything worked out alright in the end, it wasn't exactly poor visibility and cries for help would be heard if the alarm was raised. My contribution was simply to suggest one of them returned to the place they had last seen her and stay there. Everyone should carry a whistle! It's six short blows if you're in trouble - viewers correct me quickly if I'm wrong on this one. My route of descent will take me beneath Pillar Rock into Pillar Cove, shown on AW's Pillar 13 - but I didn't reach Robinson's Cairn, so I was a little off route (lost!). For that matter, I didn't see the stretcher box, but I wasn't looking for it. 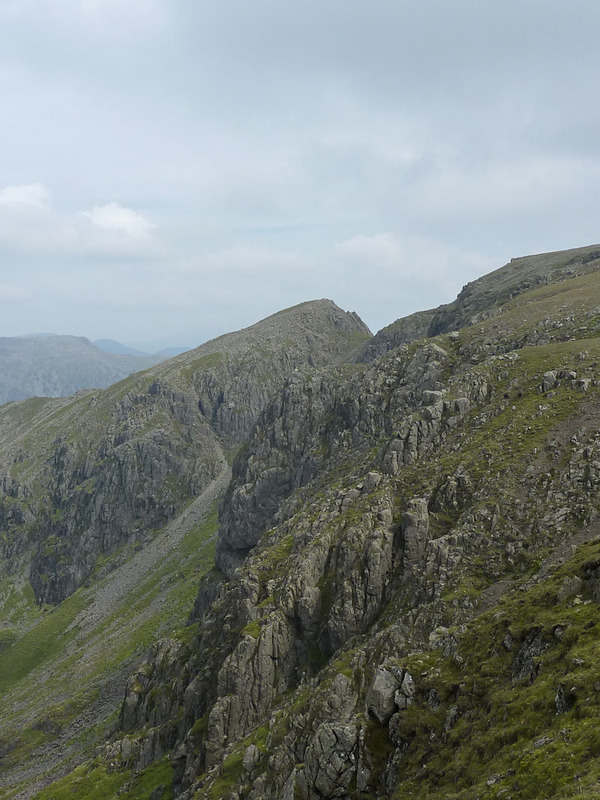 I'm looking back, the zig-zags lead to the start of the Shamrock Traverse - the diagonal route up just to the right of the two walkers in the left of the photo. Photos now difficult because the sun is just showing over the top of the fell as I look up. My word! This is a steep descent (or ascent); AW asserts 2250ft over 1 1/4 miles. An average gradient of 1-in-3. 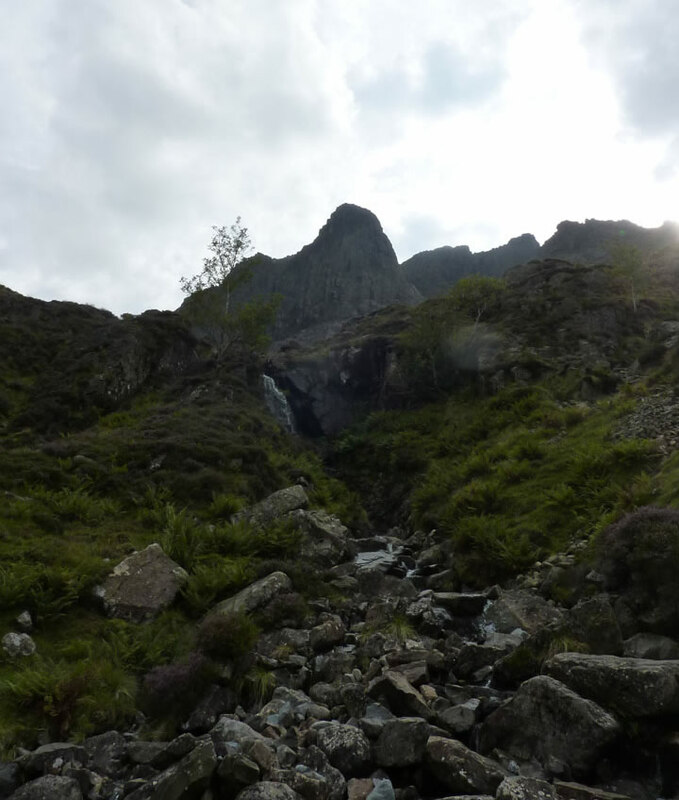 Now for the 750ft ascent to Scarth Gap, just what you need at 15:30. 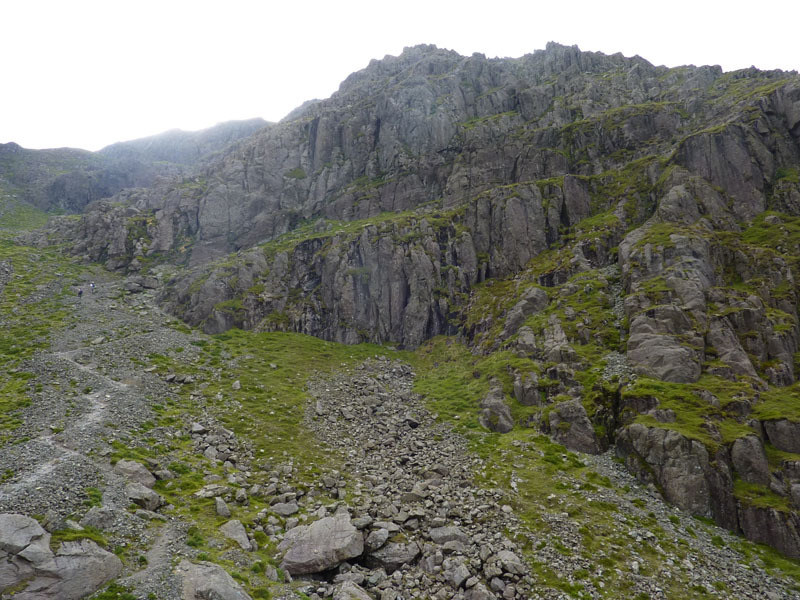 The route is a diagonal path up to the pass, not too hard. 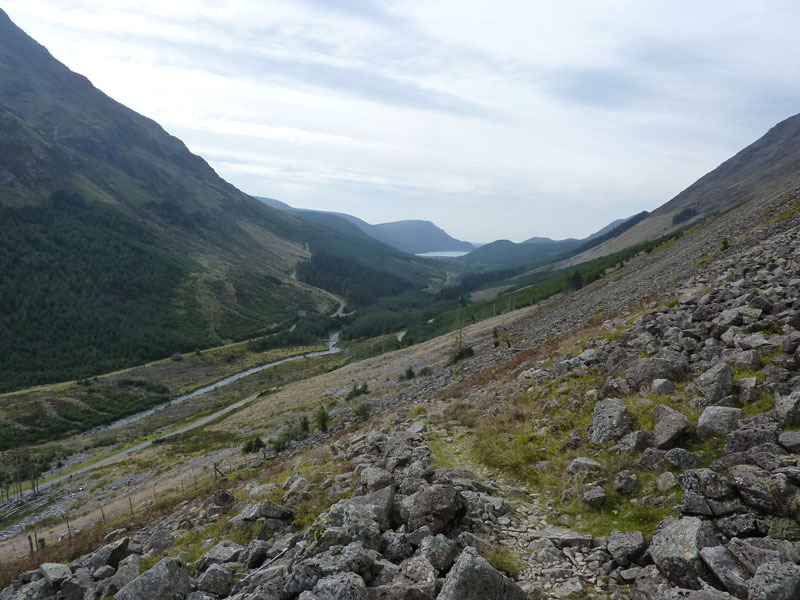 Here I am, on the path, Ennerdale Water can just be seen. 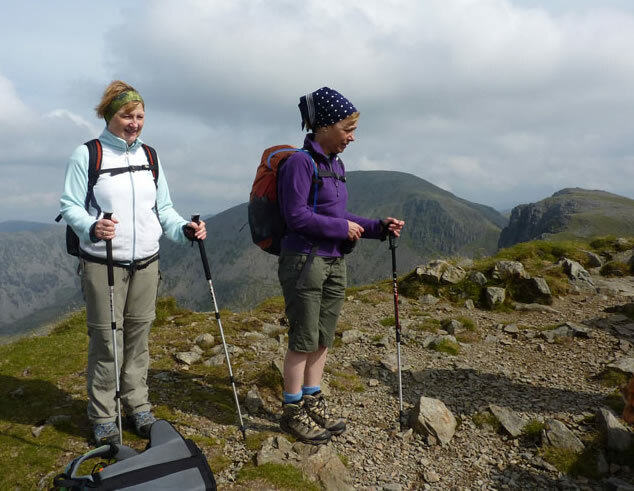 Just the small matter of the descent to Buttermere and the shoreline path back to the village and the campsite. 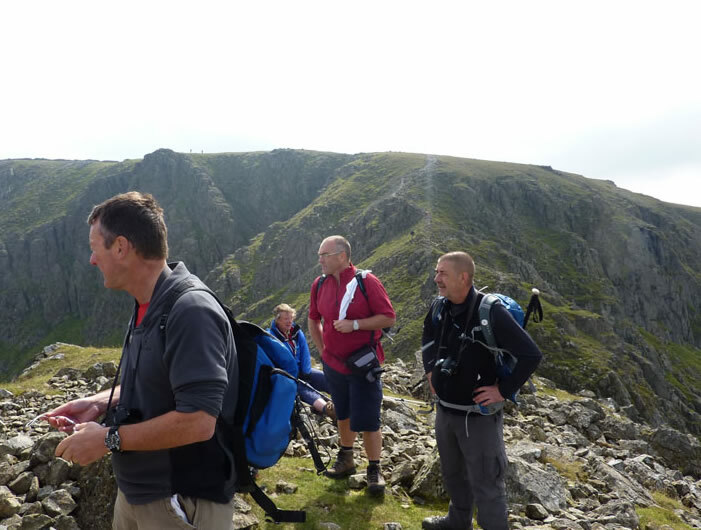 Walkers: Sixteen walkers, mainly OFC members, just myself from Steeple to Pillar and onwards. 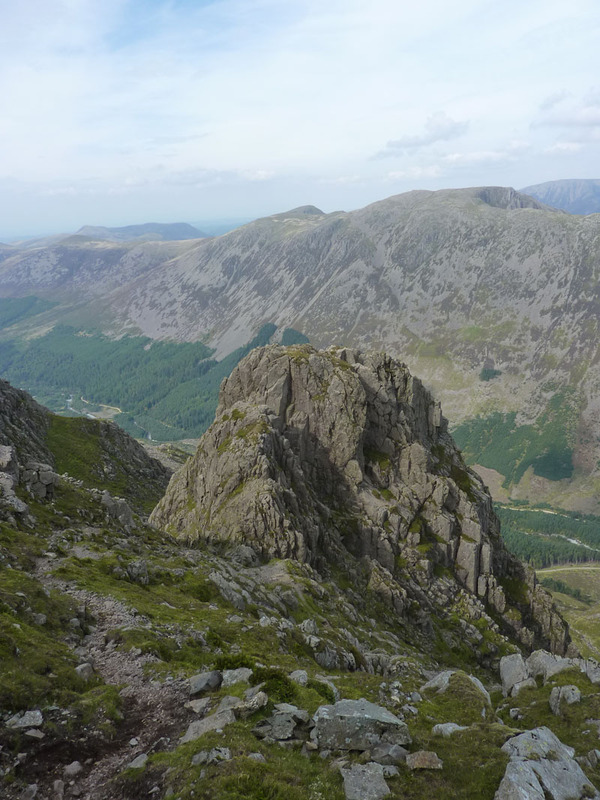 The others descended Steeple to Ennerdale Water and back to Bowness Knott. Time taken: 8hr 10 mins over a distance of approx. 14 miles. 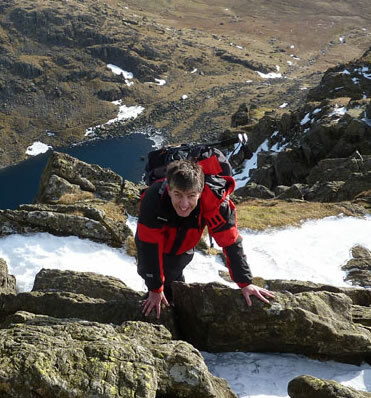 Route: Bowness Knott, Liza Bridge, Caw Fell, Haycock, Scoat Fell, Steeple, Scoat Fell, Pillar, Memorial Bridge, Scarth Gap Pass, Buttermere (lake), Buttermere Village. Weather and conditions: A bright, sometimes breezy day, with plenty of sunshine. 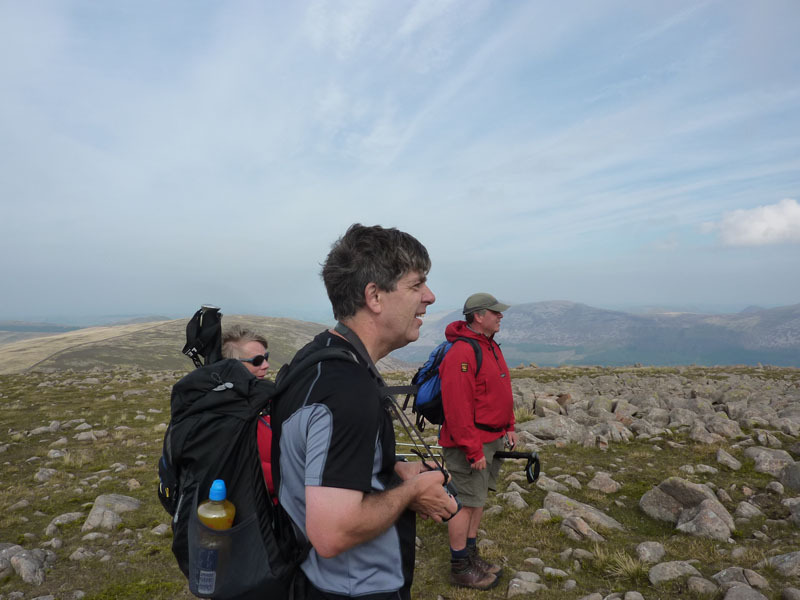 Greetings Count: Quite busy on the tops, no fellwalking tourists up here! 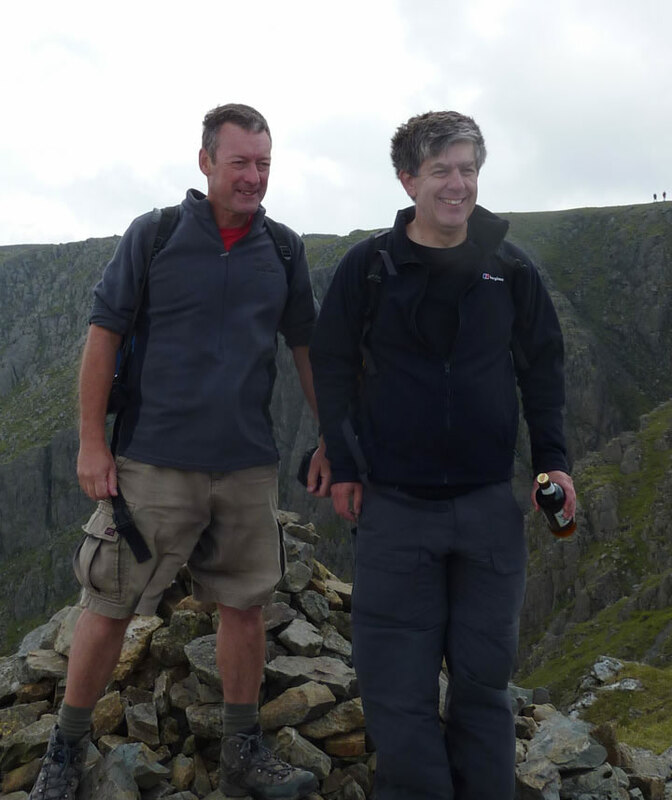 Richard's Refreshment Review: We reconvened at The Kirkstile Inn, Loweswater in the evening. A busy country pub with a good menu and real ale, brewed on site. 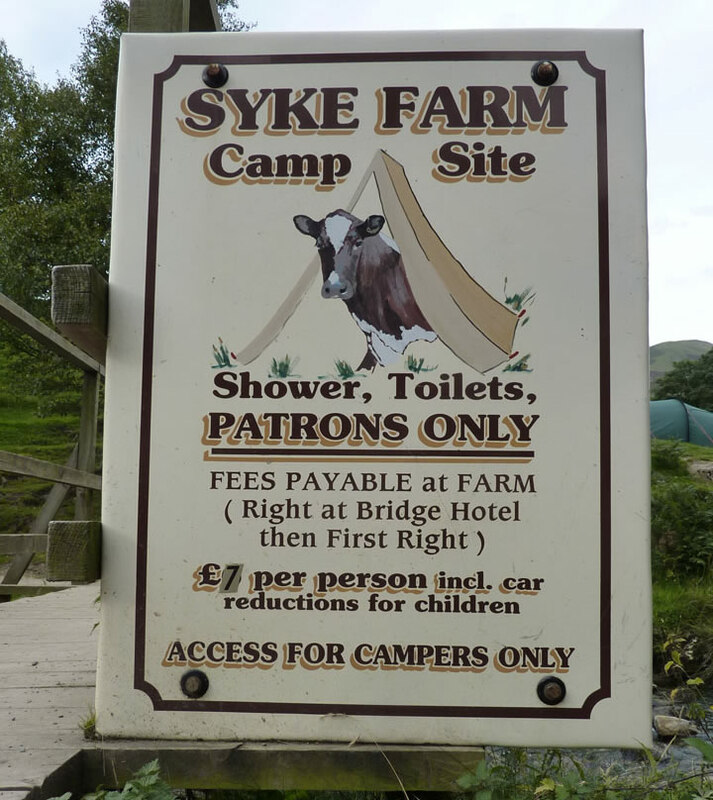 Luckily, there were no cows in my tent.